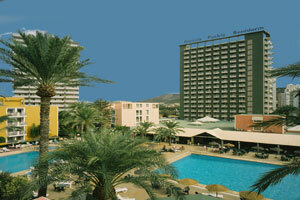 The Servigroup Pueblo Benidorm, sited just 400 yards from the Levante beach. The hotel was renovated in 1998 and is ideal for families and young people. The hotel comprises of 530 rooms, spread over five buildings with four floors with the main tower having sixteen floors. Meals are served buffet style in the main restaurant and a large selection of local and international cuisine is on offer. There are also show cooking and theme buffets daily in the restaurant.